Just Three blocks from the famous streetcar line, our volunteer guesthouse is accessible, affordable, and can house up to 38 people. 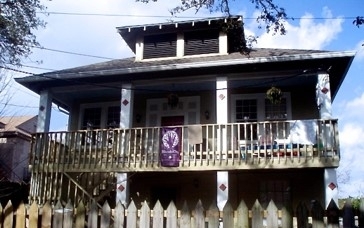 Located in the heart of New Orleans, our low cost volunteer guesthouse is centrally located in Mid-City, minutes away from the French Quarter, Garden District, and City Park. Our co-ed guesthouse can host up to 38 individuals at a rate of $35 per person per night ($40 in March and April). Our house has 5 bedrooms with multiple bunks in each room, a kitchen, dining room, and 2 full baths. As our guests, we provide breakfast and lunch daily. This includes fresh fruit, cereal, milk, juice, granola bars, sandwiches, and snacks. There's also a washer and dryer on site and a huge front porch with comfy chairs for relaxation.